It’s a doom-soaked enterprise in which “Unbreakable” stars Samuel L. Jackson and Bruce Willis are teamed up with James McAvoy of "Split." Rating: 2.5 stars out of 4. M. Night Shyamalan has crafted a very effective creepshow with “Glass,” a shotgun marriage of his 2000 horror hit “Unbreakable” and 2016’s “Split,” an even bigger blockbuster. It’s a doom-soaked enterprise in which “Unbreakable” stars Samuel L. Jackson and Bruce Willis are teamed up with James McAvoy, the man of 23 — no, make that 24; there’s a supernatural flesh-eating Beast in there — separate characters. A mass murderer, a cannibal monster and a reluctant, unlikely superhero are locked up together in a spooky madhouse. Result? Audience nerves are rubbed raw as Shyamalan marshals persistent, ominous music and oppressive close-ups of his players’ expressive — troubled and troubling — faces to build a mood of extreme disquiet. As is customary with this filmmaker’s movies, there’s a long, slow buildup to a jolting climax that contains a trademark Shyamalan plot twist. We didn’t see that one coming, did we? Aw, come on. It’s a Shyamalan picture. Of course we did. 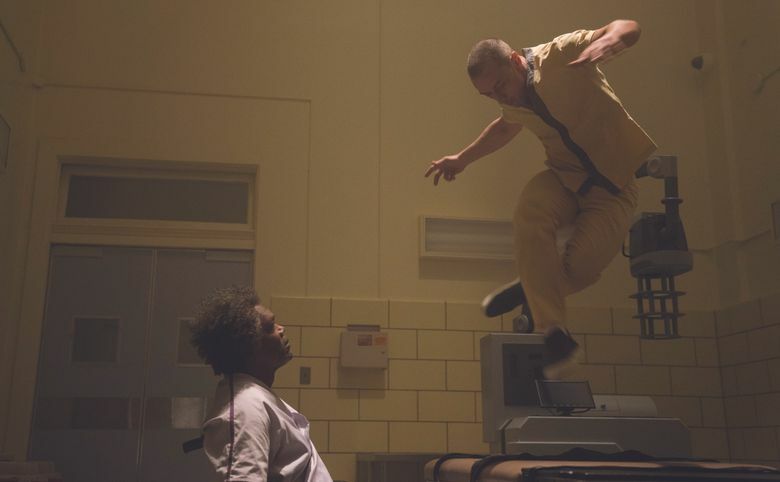 The movie doesn’t really kick into gear until past the halfway mark when Jackson’s character, a physically fragile (his bones are brittle and highly breakable) murderous criminal mastermind awakens from a drug-induced coma and incites McAvoy’s character to unleash his inner Beast. With teeth bared, muscles bulging and neck tendons looking like they’re ready to snap, Mr. Beast wreaks unholy havoc while Willis’ workingman superhero (his day job is owning a store selling security devices) strains to limit the carnage. Until that point, it almost seems like Willis’ character, David Dunn, is himself in a coma, reduced to playing a marginalized blank while Shyamalan turns McAvoy loose to hog the screen. In “Split,” McAvoy wowed with his ability to bring to vivid life his character’s multiple personalities. He had time to develop them as the man, named Kevin, terrorized three abducted young women (the survivor of the three, played by Anya Taylor-Joy, reprises her role here). 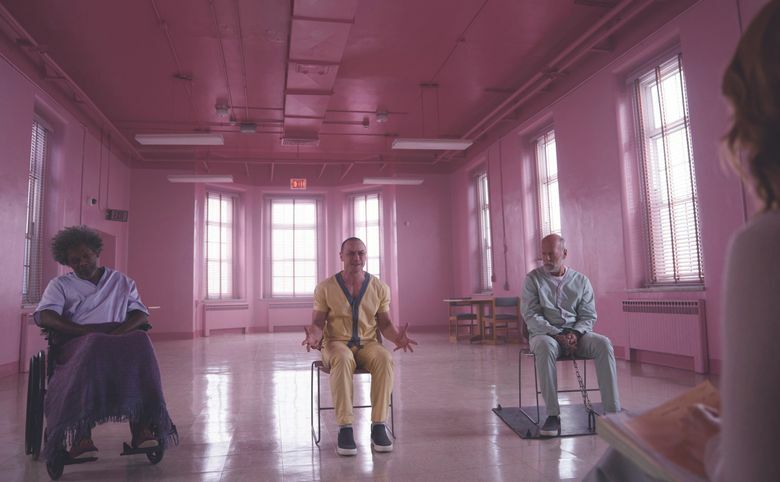 In “Glass,” he cycles through those personalities at hyper speed. It’s impressive to see, but it feels more like a stunt this time rather than a deep dive into a disordered mind. Via Jackson’s character Elijah Price, aka Mr. Glass (Get it? Breakable), a self-proclaimed comic-book expert, and Dr. Ellie Staple (Sarah Paulson), the madhouse’s top psychiatrist, Shyamalan turns the picture into a disquisition on comic books and their role in society. Price argues that comic books show that people can maximize their latent inner potential and become superheroes. Staple says she’s made it her life’s work to cure comic-book fanatics of what she views as their delusion. She’s confined Kevin, Elijah and David for the purpose of curing them whether they like it or not. Predictably, this leads to problems. Unleash the Beast! And with that unleashing comes unanticipated doom. ★★½ “Glass,” with James McAvoy, Bruce Willis, Samuel L. Jackson, Anya Taylor-Joy, Sarah Paulson, Spencer Treat Clark. Written and directed by M. Night Shyamalan. 129 minutes. Rated PG-13 for violence including some bloody images, thematic elements, and language. Opens Jan. 18 at multiple theaters. Soren Andersen: asoren7575@yahoo.com. Soren Andersen has been writing about movies since he was in high school, back when dinosaurs roamed the Earth. He has written for papers in Southern California and Washington, and was the staff critic at the News Tribune in Tacoma for 25 years.